This is my favorite kind of controversy: a completely harmless one. 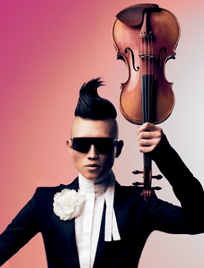 I'm speaking of the kerfuffle over the flamboyant Korean-born violinist Hahn-Bin, 25, changing his name to Amadeus Leopold. You can hear him tell why, in this WQXR Blog article, but to sum it up: after waiting five years for his American citizenship, he chose this name in July, when he finally was granted citizenship. The question is, is it a stunt? And if it is, is that bad? I view a stunt as something cooked up, very often by someone's publicist or manager, to get attention. To me a "stunt" implies something phony. But I don't think anything about Hahn-Bin/Amadeus Leopold is a stunt -- I think it's completely and authentically him. Certainly, the man wants attention. But when we bother to bring something to the stage, shouldn't we all? In the interview below, he talks about his dismay over finding half the audiences sleeping through classical concerts at Carnegie Hall and Lincoln Center. "That's a very expensive nap," he notes. A graduate of Juilliard and former longtime student of Itzhak Perlman, he definitely seems to think this music deserves more attention than that. He also says, "My exterior is only a reflection of my interior, everything on the outside stems from somewhere deep." And with a nod to Lady Gaga, "I was born this way." "This way" is really, really out there. But if you can stand back and take it for what it is -- one person's way of taking all the chaos of the world and molding it into his own mode of expression -- it's quite unique and potent. Not everyone will agree with or enjoy The-Artist-Formerly-Known-as-Hahn-Bin's way of expressing things, but I, for one, applaud his courage and would be open to seeing one of his unique performances. As for taking the name Amadeus Leopold, why not? Way to go Leopold Amadeus !!! Wish you much success in your musical career !! The name goes with a wig, I'd think..
Laurie, perhaps you could be Laurus Nilaselius? Honestly, I don't have a great deal of respect for people who feel that they need to change their names to get a piece of the action. Korea has much to be proud of. If half this guy's audience is falling asleep during a performance, I don't think that's because of an Asian name. He might better look elsewhere. Yaaaay Amdaeus!! Hot gay guy that can play the violin wonderfully AND is not afraid of making bold statements. Why can't we have more risk takers in the musicial world like him? Falling asleep isn't necessarily a bad thing. Given the pace of daily life anymore, a concert may be one of the few places where a person can relax. As for all the "born this way" nonsense, I'm pretty over it. No you were not. We were all born naked and crying, not wearing meat or eyeliner or calling ourselves Engelbert Hildegard...nurture also had x number of years to make you into what you currently are...sorry if that seems harsh. There is art and there is entertainment and then there is titillation. Where do you think this one falls on the spectrum of the sublime to the ridiculous? I think he's just doing it his way. And hmmm, as for "born this way," I suppose we could have the nature vs. nurture argument -- this could take some time and space... I'd note, for example, that an orange seed does not grow into a lemon tree. Humans are extraordinarily complex, and I have to believe that there is more programmed into our genes than the eventual shape of our noses or length of our big toes. David, I see what you are saying, but he wasn't talking about people falling asleep during his own performances, but about observing audiences at classical concerts in New York in general, and how so many audience members were snoozy. To me, I couldn't care less if he wants to change his name or anything else. If it attracts a few more audience members, I'm all for it. The violin needs to be reinvented for modern audiences. But ultimately for me, all I care is, can the man play? He's not Ehnes/Hahn/Kavakos level, but he's pretty good. I found his appearance and mannerisms distracted me from his playing, 'schtick' so often does that. Maybe it's integral to him, maybe it works for new audiences, but I'm not sure it does Mozart, et. co. any favors. I agree with Marjory about the "schtick." It's not particular good schtick is the problem. Laying down on the piano and then slowly "awakening" and picking up your violin and jumping down and start playing ... just how interesting or original is that really? But his name is an improvement over Hahn-Bin. He now has TWO names, for starters, not ONE hyphenated name. And there is less risk of him being confused with Hilary Hahn despite all his attempts to feminize his persona (costume, makeup, mannerisms). And when he is 60 there will be no "Has-Been" jokes. Leopold channels more David Bowie than David Oistrakh to my aesthetic perception. Speaking of two names vs. one, Paul, I considered Nigel Kennedy to be equally pretentious when he was calling himself simply "Kennedy". I know, a rose by any other name, etc. - but that's just the point. Why worry about names when we should be thinking about music? As for the makeup, well, whatever floats your boat - but if you're listening to a recording you're not going to see it anyway. And that's not a bad thing. Unless your goal is to put on the best freak show on earth, the music should be first and foremost. And if your goal _is_ to put on a freak show, that's fine too - but I probably won't be there. I think the way Mr. Leopold-Bin is perceived by someone is actually a good barometer of how much or how little a person actually knows about the violin and how learned a musician one is. So Nate, are you saying that if someone decides they like him, then they don't know much about classical music? I think he’d be perfect for a perfume commercial. With Cirque du Soleil dancers cavorting all around him. He makes me chuckle – I was going to say “chuckle with him” (partly, at least) but I’m not sure he’s chuckling. Even about the (silly) name change. I mean, it’s a whimsical name choice, but I don’t sense any whimsy – or maybe it’s all tongue in cheek (even the bizarrely earnest and self-aggrandizing interviews) and I’m just too dense to pick up on it. Maybe it’s just a (cynical) attempt to gain attention. I’d get more of a kick out of it if I detected a sense of intentional irony. I’d get even more of a kick out of his antics if he was pushing any musical limits – either in his musical interpretations or in his repertoire, which seems pretty staid and conventional from what I can gather. I guess I’m just less interested in fashion statements than I am in musical statements – and it’s there that I would look to a healthy future for classical music and seats filled with awake audience members. I do think that the best musical experience is one in which the excellence lies in the music. That said, I still think the classical world should be dynamic enough to support experimentation and risk. Considering how much everyone wants to pillory this guy, I doubt that this is some kind of calculated popularity move! I'm certainly not interested in pillorying him! But I do wonder about his priorities. Is his point to present, say Mozart, or to present himself? For me, there's a difference. A performer is an interpreter, right? That means they are a kind of vehicle, bringing their own heart and intelligence to bear on something another person wrote. And, of course, to a lesser degree other artists use mannerisms, costuming, publicity to present themselves, and, (again, for me!) quite often that presentation detracts from the music they are purportedly interpreting. Mozart doesn't NEED costuming, exaggerated gestures, or anything else. (I keep saying "Mozart" but he's just one of many, many names I could use). I guess maybe its the difference between performance and performance art. Each has its place, but when they overlap, I'm not sure who wins...if anyone. Although I find it very hard to imagine how he could feel the same way when listen to Bach and Madona, I admire that he dares to be controversial. A performer interprets, as Marjory and other suggested, thus certain amount of respect of the original written texts is expected of each performer. But an artist does more than mere interpretation. Without contributing individual imagination and creativity, the interpreter becomes a machine, which is probably the hardest thing for a true artist to live up to. Really interesting discussion so far and the different arguments are quite predictable, a lot to do with difference in taste. And unlike expressing different political and moral tastes, this is all shown in a completely harmless way, just as Laurie predicted. Wow-I liked it. Love -love the imagery and his playing. He is definitely a performer. It's these artists that give a new look on old tradition. I admit I am not as refined in my violin knowledge, but it's this that may intrigue future players which keeps the arts alive. Amused skepticism about Mr. Leopold's specific fashion-oriented, theatrical experimentation and risk taking should not necessarily be construed as skepticism toward all experimentation and risk taking in classical music. In fact, I'm all for experimentation and risk taking, Mr. Leopold's included -- even if it's not my particular cup of tea. No desire to pillory anyone. All I've gotta say is, Metta World Peace and Ocho Cinco...! I've never seen him live, but I was a little disappointed in the video. When he was a child, he put on little shows and "actually sold tickets" to them? That's nice, and shows creativity, but I did that kind of thing too, and so do a lot of kids. I think he comes across as a little too precious and self-absorbed. I also thought it was interesting that he starts the video with the same piece that the girl violinist is playing in the recent "Karate Kid" movie, for her high-stakes audition into a big Chinese conservatory. The movie uses the piece as a kind of emblem of classical music on a pedestal: beautiful, achievement-oriented, "perfect" etc. And then it is used in contrast with her relationship with the protagonist (an American expat boy in dreadlocks played by Jaden Smith). Her parents don't want the girl to have anything to do with him, at first. They think he will mess up her chances of getting into the conservatory. It being a Hollywood movie, the parents eventually relent and the two characters develop a mutually supportive relationship where they both learn from each other. I'm wondering if Amadeus Leopold/Bin-Han is trying to get at a similar concept, of melding east and west. It's a nice idea, and maybe he's still just working it out. He's quite young yet and has a lot of years ahead of him. But as I said, it's a little disappointing here. I don't really even see the depth of the karate kid in what he's doing. Unless any of us have seen a concert, we probably don't really know what's going on. We don't know the full context of how his dress and manner are affecting an entire program. He says in his youtube interview that he's performed in a variety of venues, for a variety of audiences: from children to elderly people. And he says that in his performances all of his audiences say that what he does serves the music. If that's the case, what is there to argue about? He plays well, he's legitimate. If you take away all of the visual trappings, he's still both a good violinist and musician. Terry, you're right. I said on another thread that I was going to try not to judge musicians by their marketing. That's probably a good thing to keep in mind in this case also. I think that everyone can tell the difference between a technically accomplished musician and one without such accomplishments. Sadly there are many who cannot distinguish between aesthetically or artistically accomplished musicians and those ungifted artistically. Some even deny the possibility of such differences. They might as well be deaf and blind. Considering how much everyone wants to pillory this guy, I doubt that this is some kind of calculated popularity move! And Marilyn Manson, Lady Gaga, Madonna, Alice Cooper and-you-can-go-on-and-on....? As is often said, "there's no such thing as bad press" - and here we are, talking about him. Thus, put me firmly in the "stunt" crowd with other respondents above. I think this guy is a good musician with good musical instincts. He has good aesthetic sense musically. One can argue whether or not he has the best artistic sense visually, but to me, what he's doing with his dress and manner just doesn't really bother me. A 2nd row fiddler who adorns himself with the names of the two great Mozarts is guaranteed to lose. Who should see him, together with his clownery, as a serious artist? The people who love and understand Mozart? Unlikely. They will stay with the players, not with the clowns. And I think I'm not the only one raised in the european culture who feels it as a lack of respect. Who cares? But he's out of the game for people like me. Ignore his attire and just listen to him. Can he play? I say he can. Terry, I learned as a small child that when it comes to music (classical music) you use your ears and sit still. This is still the right attitude. And stuff that is consistent with his clown thing is of no interest to me. That's pretty reasonable Tobias. I remember going to master classes of Sandor Vegh. Once there was a girl playing Brahms G major sonata, beautifully. She was going to Juilliard. He said she moved too much, and if you move too much on stage, you move the audience less in their hearts. It's arguable that Hahn-Bin / Amadeus Leopold is distracting from his real playing, I think that's a reasonable possible position to take. His dress is certainly unusual, but is it unusual just because we're not used to it? You have to dress up in some way. A tuxedo would be distracting if everyone was used to seeing people dress up as H-B/AL dresses. But apart from getting off of pianos to play, walking around a little bit, he's not doing that much that's distracting. And the main thing to me is that he says in his youtube video all of his audiences (from young to old) say that what he's doing serves the music. If that's the case, what are we arguing about? His audiences love his playing, isn't that a good thing? Above is a link of him playing Carmen Fantasy. I'm assuming that when they cut away from him during his tutti sections that he's not doing twirls or something, although I can't say for sure. I can't find a youtube clip that shows an entire performance of him playing some real music, like Bach, Brahms, Beethoven concerto. There is a link of him playing Sibelius (very well by the way) at 15 - before he started dressing the way he does. If he schlocks up Csardas, who cares in my opinion. Csardas deserves to be schlocked up. There's a long and sometimes amusing history of changed names in music. These are sometimes geared to the market to make the artist seem more exotic. My favorite is the famous piano teacher, Mme. Olga Samaroff, the teacher of many leading pianists. I had a good laugh with I discovered that her real name was Lucille Hickenlooper, from a well-known political family. Almost as good are the transformations of Sarah Nelson to Zara Nelsova, or the transformation of Mischa Fishburg to Mischa Mischakoff. I don't quite know whether to believe this, but a friend attended a party for Ruggiero Ricci and noticed people calling him "Woody". Evidently his original name was Woodrow Wilson Rich! I'd like to have this verified, because this is spectacular.